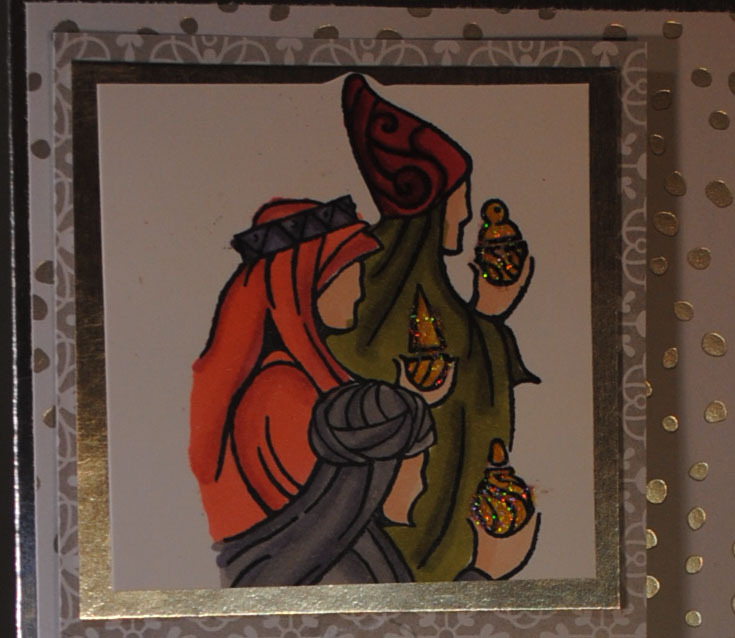 This beautiful Tall & Skinny Holiday card is made with the Holy Triptych stamp set from Stampin’ Up!. Even though this set is retired, it is perfect for the Blendabilities markers. This card measures 4 1/4″ x 9″. The base is a sheet of Silver Foil Cardstock cut to 9″ and scored at 4 1/4″ with my trusty Stampin’ Trimmer. The background paper is the silver polka dot paper from the All is Calm Designer paper specialty pack. The silver designer paper is cut to 4″ x 8 3/4″. The next layer is the smokey slate patterned designer paper from the All is Calm DSP. 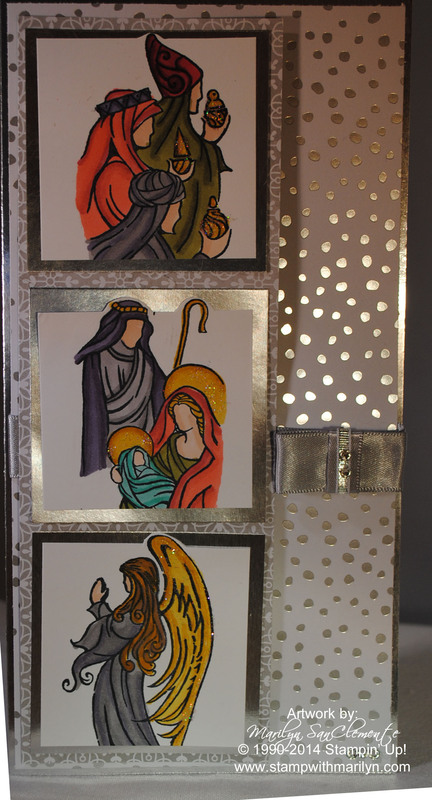 Each image from Holy Triptych stamp set is stamped with Momento ink and colored with the Blendabilities markers. The images are cut to 2 1/2″ squares and mounted on squares of silver foil. Of course, no card is complete without a little bling… So I added some Dazzling Details to the halos, wings and gifts of each of the images. The card is finished off with a piece of Silver Satin Ribbon folded into a bow and enhanced with a piece of Narrow silver ribbon and Rhinestone Jewels. This card was inspired by the sketch from today’s Mojo Monday sketch! Want to learn how to use the Blendabiilties? Check out my class tomorrow night – Tues. Oct. 28th. Details here. Happy Stamping!